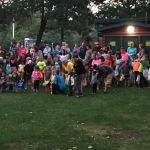 Ask fellow campers about "Oscoda / Tawas KOA" and nearby attractions. This park has made several additions/upgrades to activities especially those for kids. It is a great family campground. Sites are decently roomy with some large trees for partial shade. Staff is friendly and very helpful. Our site was level and hookups easily accessible. We were on a 'Buddy' site with other family members (Sites 8 & 9) which was great. There are a few other buddy sites in various parts of the park. It's a nice option if you are traveling with other friends or family. We enjoy camping here! We camped at Oscoda / Tawas KOA in a Travel Trailer. Oscoda and Tawas are nearby towns with services, shops, grocery stores, etc. There are several nearby beaches and a state park with a lighthouse. This is a older campground in need of some updates. The main bathroom is at the front entrance and midway in the campground is two separate single unit shower/toilet bathrooms. There is a train that right by the campground which woke us all up in the middle of the night. But the bright side is it's a good place for kids. We camped at Oscoda / Tawas KOA in a Fifth Wheel. Nice park. If you have kids that need things to do this is where to stay. Grounds are well kept with no trash on the ground. Sites are generous by most standards and mostly level but you may need a block or 2 under one side to level up. We had no problem getting level and did use blocks under the wheels to do it. Very quiet and peaceful but there is a train very close that runs 2 times a day....very early and very late, so expect to hear it. Nice folks manage it and are eager to help if you need anything. I would stay here again. 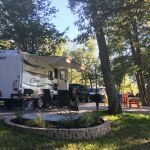 We camped at Oscoda / Tawas KOA in a Travel Trailer. This is a kid-friendly RV park, as are all KOA. It is heavily wooded, which we like, and quite rustic. Interior roads are gravel or dirt, and our site was gravel, and not very level. Very quiet at night, but for the single train which comes through on the nearby tracks. Excellent WiFi and analog cable TV, with good AT&T and Verizon coverage. We camped at Oscoda / Tawas KOA in a Fifth Wheel. Very nice camp ground. Lots of family activities and a nice play ground. We had a pull-through site which was fairly level and had a cement patio with a gravel parking area. The roads are dirt but well maintained. The cable TV hookup was excellent and the WiFi was good, not fast but okay for our needs. The park has completed several updates and they showed. At the time we were there, in the middle of the week, the park was about 1/3 full. The staff was helpful and friendly. Our coach is mid-sized and anything over 38-40 feet long may have trouble making some of the turns. Ours (35ft.) was okay with even with pulling a tow. The only real negative for some would be the park is next to a railroad track. We had our 4 years old grandson with us and he loved watching the trains go bye. Trains pass 2 to 3 times a day and are on the short side so we did not find them a bother. If in the area we would stay here again. We camped at Oscoda / Tawas KOA in a Motorhome. Large KOA with all the amenities including a jumping thingy, game room, pancake breakfast, etc., with nice hosts and workers. Utilities were good and the location is ok with a short drive to town or a longer drive to Wal-Mart. We camped at Oscoda / Tawas KOA in a Motorhome. The campground has a very friendly staff with some organized activities on weekends such as candy hunt, fire truck rides, and hay ride. They have a jumping pillow, playground and nice arcade. It has decent sized lots with lots of shade. The campground does run along a train track. The train went through later at night. It did not bother us and the kids actually enjoyed it. It is close to both Oscoda and Tawas with some really nice scenic views. We will definitely come here again. We camped at Oscoda / Tawas KOA in a Travel Trailer. This is a great campground. The owners go out of their way to make sure your trip is enjoyable. They have nice size pull thru sites that are wooded. My kids loved the jumping pillow. They deliver campfire wood and ice to your site. A bad storm came through and they came to each camper to notify everyone where to go. The only negative comment I have is that the bathrooms need to be cleaned more than once a day. On the weekend the campground was quite full and cleaning the restrooms once a day is not enough. I know you will enjoy this campground! We camped at Oscoda / Tawas KOA in a Travel Trailer. 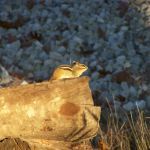 Sites are graveled, grass or dirt; some of the nicest tent sites we've seen in a private campground: in the woods, spacious, set apart from other campsites. And they get the best bathhouse too: satellite one is newer, with toilet, sink and shower all together in private rooms. RV sites: some pull-through, some back-in, vary in how level they are. The entire campground is shaded and attractive. Owners are fairly new and working to make improvements in the campground. The main drawback is the train track; during our stay, trains came by only in the middle of the night, blowing their horns for the crossing which is the entry road into the campground. Very little can be done about that! But in other ways this is a nice campground for a base camp in the area, and should be even nicer in a year or two. We camped at Oscoda / Tawas KOA in a Travel Trailer. The $36 rate was with KOA discount. The Wifi was very good. I'd recommended for trailers, 5th wheels and tents only. I'd not recommended for motorhomes unless equipped with levelers that can lift 8 inches or more. Gravel roads in woods with mosquitoes. We camped at Oscoda / Tawas KOA in a Motorhome. Are you affiliated with Oscoda / Tawas KOA ?